It’s a long way from Atlanta to Los Angeles, and it’s longer still without identification, money, or the legal ability to board a plane, and with the forced company of a man whose nonstop chatter includes a boast about having 90 friends on Facebook, 12 of them pending. 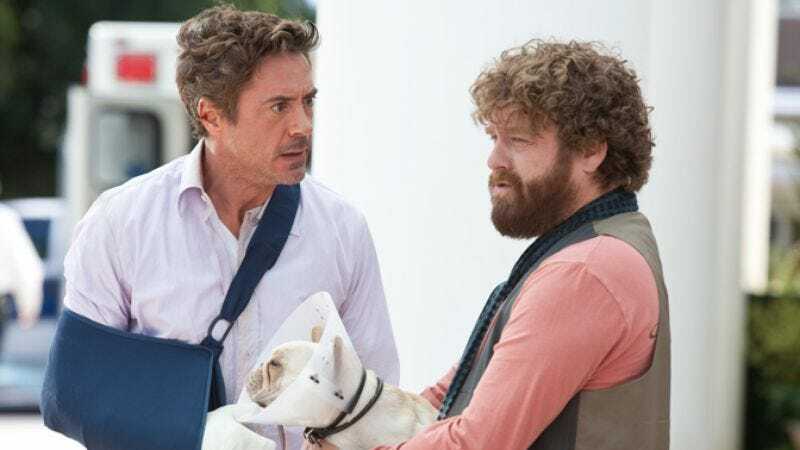 But when deadlines loom, you do what you have to do, as Robert Downey Jr. discovers in Due Date. A successful, tightly wound architect working away from his expectant wife (Michelle Monaghan) mere days before her scheduled C-section, Downey winds up sharing a rental car with Zach Galifianakis, who plays an aspiring actor of dubious talent, eager to make it in Hollywood after the death of his beloved father. Well, not so eager that he can’t make their first stop a side trip to buy some weed. So begins a rambling cross-country journey that makes a lot of familiar buddy-movie stops along the way, but seldom suffers for it. Directing with more focus— and eventually, more heart—than he brought to The Hangover, Todd Phillips smartly lets his leads’ chemistry power the movie. First seen wearing a Bluetooth headset to bed, Downey’s character might have been a cliché of uptightdom in other hands, but Downey makes him a volatile bundle of anger and familial concern kept from exploding only by his desire to see the birth of his child. Galifianakis, on the other hand, keeps his character interesting by refusing to define what type of weirdo he’s playing. His mere appearance is a contradiction: A burly man with an effete sashay and soulful (though glassy) eyes, his character lives on the tissue-thin line dividing helpless naïveté from the disarming confidence of someone who decided he was fine being a misfit long ago. Phillips throws in at least one screaming-and-driving scene too many—are funny car chases ever really that funny?—but the film keeps finding memorable comic moments between scenes that develop a strange, real bond between the two men. The situations sometimes feel contrived, but the characters never do, particularly because Galifianakis remains simultaneously charming and unrelentingly irritating. It’s easy to believe Downey would come to feel for the guy, equally easy to understand why he’d want to throttle him with Galifianakis’ ever-present scarf. And the film benefits—both comically and emotionally—from leaving both possibilities look equally likely almost to the end.